You may not advertise during the championships and can’t make political or religious expressions. The organization reserves the right to refuse applicants for any reason. From the very beginning WLSF has had a huge appeal to young and old. 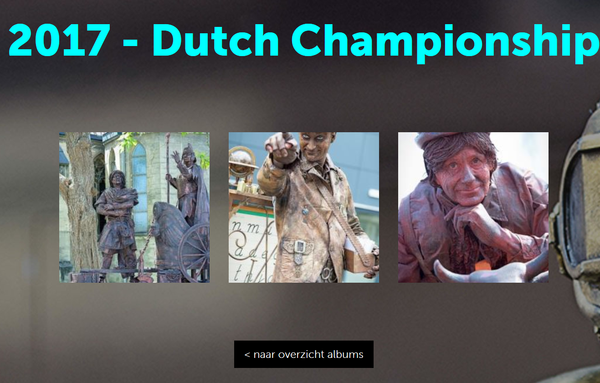 Each festival edition has introduced more than 200.000 visitors to 200 artistic, eloquent and/or funny living statues. On the art form itself the impact of the festival is huge. Since John Eicke, the new Artistic Director of the International WLSF, was chosen World Champion (for the second time! ), he has travelled without interruption from one festival to another all over the world. “Participating in Arnhem” says almost everything in the world of the living statue. But the many visitors also look forward to the festival. And publicity? From Australia to Canada and from Argentina to China…everywhere there is attention for the festival. This is, quite simply, the place to be for living statues! And now, in 2017, the festival continues to innovate and ensure that ‘Arnhem’ will be even more entrenched as a global base for this form of street art. How do we do this? Through hard work on all improvement and innovation opportunities. With a lot of enthusiasm and the tireless commitment of our brand-new WLSF team – who are very well-known in the world of living statues – the most important basis is there. We are looking forward. You too? Then we would like to meet you at The Premiere on Saturday and the World Championship on Sunday.